Co-sponsored by WQLN and JazzErie, with support from Local 17, AF of M.. 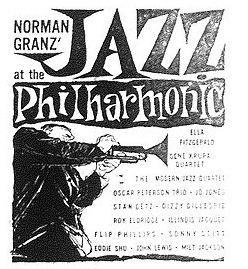 This concert will be a re-creation of the legendary "Jazz at the Philharmonic" concerts produced by jazz impresario Norman Granz and featuring a stellar rhythm section and a collection of the best soloists of the day. These occasional concerts began in 1946 and extended into the 1960's..
Our concert, in the same free-wheeling spirit, will combine a fine local rhythm section and some of the best soloists in the area. 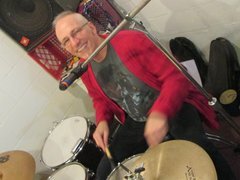 Featured will be a rotating cast made up of Joe Dorris -- drums,vocals, harmonica; and Frank Singer -- guitar, vocals; Tony Stefanelli and Joe Frisina -- electric bass; Nick "Tito" Ronzitti -- drums & percussion, Matt Ferfuson and Tim Driscoll -- drums. Featured soloists will include Bruce Johnstone -- baritone and soprano saxophones, Allen Zurcher-- saxophones, Phil Popotnik and Kenny Gamble -- saxophones; singers Julia Hamilton and Diane Lacastro; guitarists Jim Lynch, Vinny Stefanelli and Dave VanAmburg. The concert will be outdoors. Bring your blanket and/or lawn chair. Beer and coffee will be available.